Brush guidance, brush wear and how to properly care and maintain your brushes. 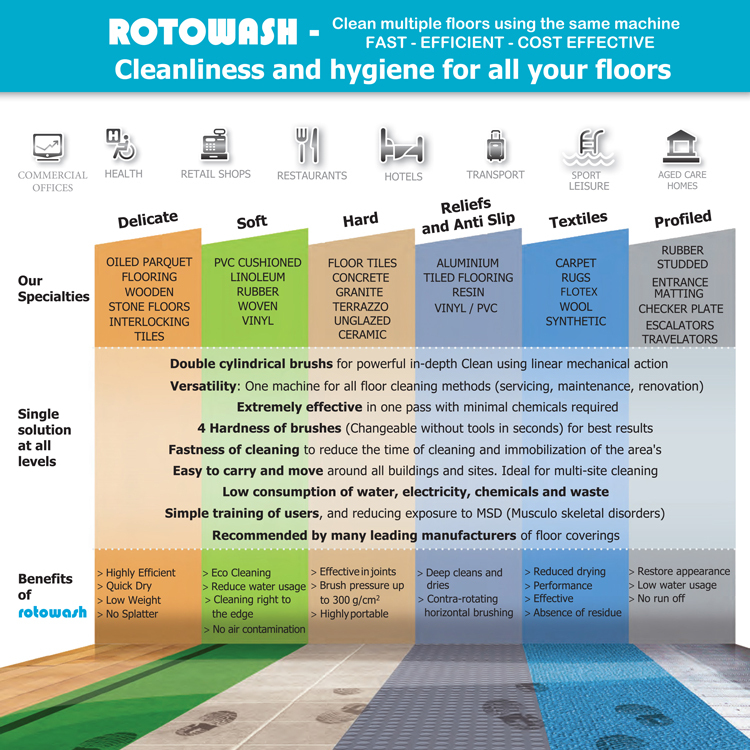 Rotowash machines and accessories are built to the highest international standards on quality, design, electrical and safety, without exception and without compromise. High quality and long lasting, Rotowash brushes are designed to enhance and extend the cleaning method of the entire Rotowash range. Color coded to prevent cross-contamination. 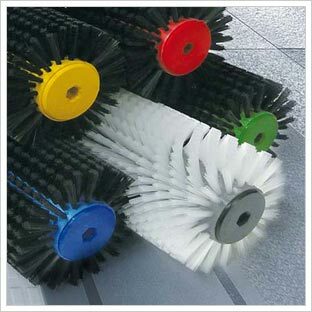 STANDARD black bristle brushes come with a choice of colour coded cores and end caps to help raise cleaning safety standards. choice in your cleaning safety policy. Rotowash brushes are specifically designed to enhance and extend the cleaning method of the Rotowash range of professional floor cleaning machines. Rotowash brushes are constructed from high quality polypropylene materials and meet the highest British and E.E.C standards on quality, safety and design. 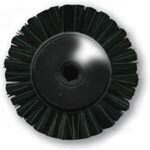 Rotowash brushes work effectively with most modern cleaning chemicals. Because of the spin speed used in the Rotowash system, the brushes tend to be largely self-cleaning under most circumstances. After use, the brushes need to be removed to clean and sanitize the machine surfaces. The brushes should be rinsed and agitated until the water runs clean. Brushes should then be stood on end to air-dry or put back into position on the machine and the machine left standing on the transport wheels. In order to prevent a soil and chemical buildup on the brushes, a weekly detergent soak (using a detergent which differs from that used for the floor cleaning process) will help to keep the brushes soft and clean, helping to prolong their useful life. The brushes are made from polypropylene and can be left to soak in any suitable solution, in order to sterilize them. On restoring clean dry brushes into the Rotowash machine, ensure that they, or the floor are moistened before starting the machine. The standard brush can be put through an autoclave cycle. This should be a steam autoclave and the lower temperature selected. Other autoclave systems can be used but care needs to be taken to avoid damage to the brushes.